Tom Norton scored for Phantoms in Hull. Peterborough Phantoms received some welcome cheer last night (March 4) by triumphing at one of their unhappiest hunting grounds. The city side eased to a 4-1 success in Hull to snap a run of three successive defeats and boost their hopes of securing third spot in the English Premier League. Ales Padelek opened the scoring for Phantoms in Hull. They recovered from the early setback of conceding after just 63 seconds, to the hottest shot in the second tier of the sport, to have the contest won by two-thirds distance. 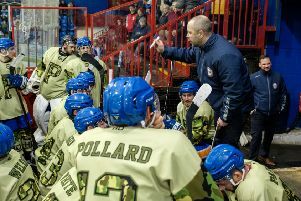 Coach Slava Koulikov said: “We got a lot of guys back from injury last weekend and we knew we had to get back to winning hockey games this weekend. “Hull is a rink in which we have struggled previously over the last two seasons so it was nice to pick up the victory for that reason, along with the fact it gives us a little bit of momentum going into some big weekends ahead. Phantoms defenceman Ben Russell claimed a rare goal in Hull. Andrej Themar was the man to make the early breakthrough for Hull, but it was Phantoms - rather than the Pirates - who emerged with the treasure. Ales Padelek hit a quick equaliser before Tom Norton struck on the powerplay to give the visitors the advantage. They were further aided by the ejection of volatile Hull forward Ryan Watt for a needless sucker-punch on Will Weldon, and went on to take command with two further goals in the middle stanza. Defenceman Ben Russell grabbed the first of them – just his second in Phantoms colours – before big Petr Stepanek sewed up the points nine seconds before the buzzer. And that’s the way it stayed during a blank final period as Koulikov and co reflected on a good night’s work. It was a victory achieved without the services of all of their imports. Lithaunian international Darius Pliskauskas sat out the trip north, but Aussie ace Wehebe Darge did return after missing the last two games. Phantoms are back in action next Saturday (March 11) when they travel to Guildford for their penultimate fixture of the regular season. And that Surrey showdown is swiftly followed by the opening leg of the EPL Cup final against fierce rivals Milton Keynes the following night (March 12, 5.30pm).